Hot, golden, and lightly salted, fries have appeared on the menu at White House state dinners, they are a staple at diners and drive-ins, and a former first lady even ordered some on a visit to Buckingham Palace. From the palace to Pullman, the beloved French fry knows few bounds. Each fall, truckloads of harvested potatoes make their way to Pullman and Washington State University where they are washed, peeled, sliced, and fried. A sweet, yet savory, aroma drifts down the hallway from a room where volunteers, like myself, have come for the culinary trials—an annual French fry taste test. 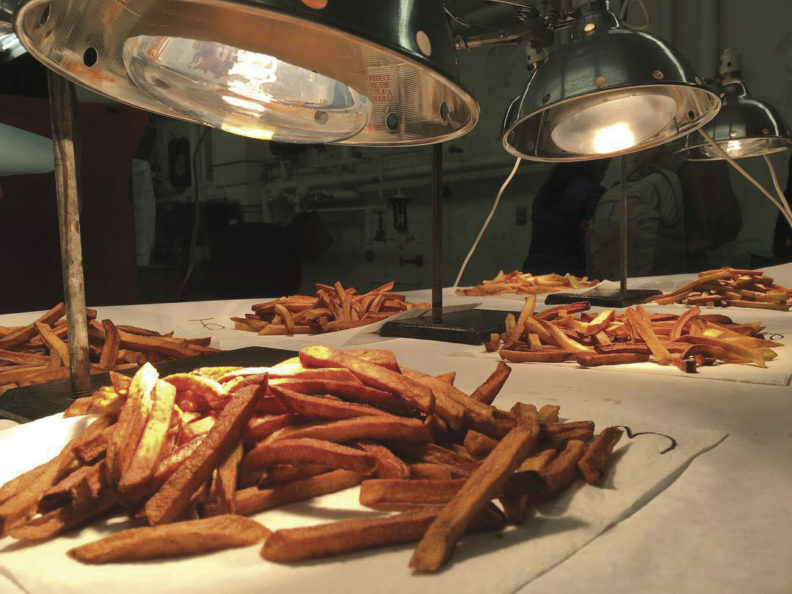 On a long table, ten piles of golden fries sit glowing beneath heat lamps that shine down like spotlights on the contenders. Each pile features a fresh potato variety that was trucked in from Idaho, Oregon, and Washington. WSU plant scientist Rick Knowles and researchers in the Tri-State Potato Breeding program selected the potato varieties for the trial the previous winter. “We put them through a number of field and storage trials and assess the quality characteristics that will give us the next best French fry,” says Knowles. One volunteer mentions she’s been coming to the culinary trials for the last 14 years, adding that she now associates fall with French fry season. We note the fry color, rigidity, texture, and overall flavor. There’s no salt or sauce. For now, it’s all about the fried potato and how it tastes. In the WSU Potato Research Lab, these culinary trials are just one of many evaluations that go into producing a new potato variety for French fries. From the initial crossing of parents with desirable traits, to selection of progeny, to evaluation of performance, developing a new potato can span up to 15 years. In the last decade, the Tri-State Potato Breeding program has produced 21 new potato varieties. Ranger Russet, Umatilla Russet, Blazer Russet, and Clearwater Russet are the Tri-State varieties used by McDonald’s to make their signature French fry. For Knowles and team, patience pays off when the new varieties reach consumers and are sold in grocery stores or served up at global chains and local restaurants. Fries can take on many forms—shoestring, steak cut, curly—and Americans eat a lot of them. In the United States, the average person consumes 34 pounds of fries a year, according to a 2017 study, says Del Krumm ’89, plant manager at Lamb Weston in Connell. He estimates Lamb Weston will produce 2 billion pounds of fries in Washington state this year. 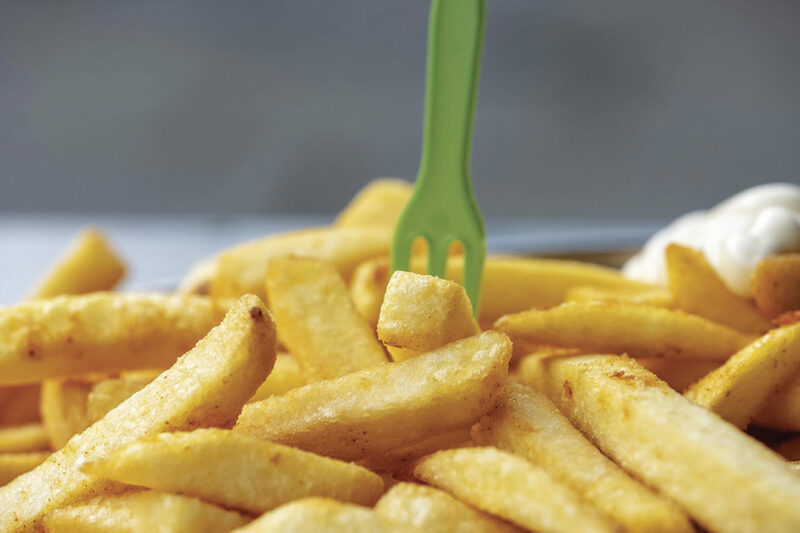 Assuming a 4-ounce serving size, that’s about 8 billion servings of fries produced in the state by one of the biggest frozen potato suppliers in the world. Krumm enjoys being part of an industry that brings so much joy to people, where he can meet the always changing consumer needs and also work with Washington’s potato growers. Washington produces 23 percent of the nation’s potatoes, according to the Washington State Potato Commission—87 percent of those potatoes are made into mashed potatoes, crunchy potato chips, and other products, like fries. 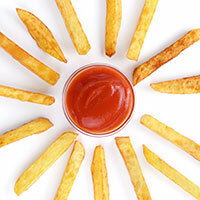 While the origin of fries remains uncertain, some have argued they had their beginnings in Belgium or France. Whether or not fries actually came from France, some French cookbooks offer different ways to slice up the potatoes before frying. For pommes frites allumettes, cut the potato into thick pieces like matchsticks. Use the fluted blade of a mandoline for waffle-cut fries, or pommes gaufrettes. Then there are pommes frites pont-neuf, small wedged potatoes, that some say were served in the oldest Parisian fry shops. Of course, where there are fries or frites, we often find sauce. On a trip to Brussels last summer, a friend and I ate thick, golden fries served up in a paper cone. While fries don’t often require utensils, these came with a small, wooden two-pronged fork for easy dipping into a side of spicy mayo. There is perhaps nothing more tempting to this fry lover than a side of crinkle fries and fry sauce from Cougar Country Drive-In in Pullman. Whether it’s fry sauce, ketchup, aioli, chili cheese, mustard, brown gravy and cheese curds, or maybe even a milkshake, the variety of ways to dress up fries might be almost as versatile as the French fried potato itself.